Easter is a week away and the question today is, Where is your focus? When we go shopping do we see symbols of Jesus resurrection or a huge display of Easter baskets, chocolates and jelly beans? Unfortunately, it is hard to find anything that honors the true meaning of the Easter, Jesus is alive!! Celebrating with fun, food and family is great and there is nothing wrong with that, as long as our focus is on Jesus. Let’s be sure our children and grandchildren know and understand that Jesus died, was buried and three days later HE AROSE!! 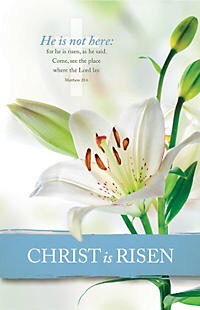 During the Easter season of 1874, while having his devotions one evening, Robert Lowry was impressed with the events associated with Christ’s resurrection, especially with these words recorded in Luke 24:6, 7—He is not here, but is risen. Soon Robert Lowry found himself seated at the little pump organ in the parlor of his home. And in a very spontaneous fashion, the words and music of “Christ Arose” gave expression to the thoughts that had been uppermost in his mind. The hymn was published the following year and has been an inspirational favorite with God’s people ever since. Have a Happy and Blessed Easter from all the staff at SOS Events Ministry. Pilate tried to prove his innocence by washing his hands, but his sin could not be taken away by washing. The only thing that can wash away sin is the blood of Jesus and trusting in His death, burial and resurrection. Pilate was guilty of helping to send Jesus to the cross, but God used him to fulfill prophecy.